The 24 year old from Somerset was competing in the 17th World Championships of his career, and a perfect display saw him progress from the qualifying rounds to the final unbeaten. Phillips led from start to finish in the decisive race to beat home favourite Marc Willers and finally earn himself a rainbow jersey. Cycling Weekly spoke to him a day after he arrived back in Britain. Have you got used to being a world champion yet? LP: No, and I don’t think I will for some time. Obviously, you plan for these races for such a long time, but when you achieve what you set out to, it feels surreal. It’s been pretty crazy since I won the jersey – crazy but good fun. Having never won a world title before, how confident were you that this was your year? LP: I was definitely hopeful. I knew I had done the work necessary in training and that I was going to New Zealand with the form to win. 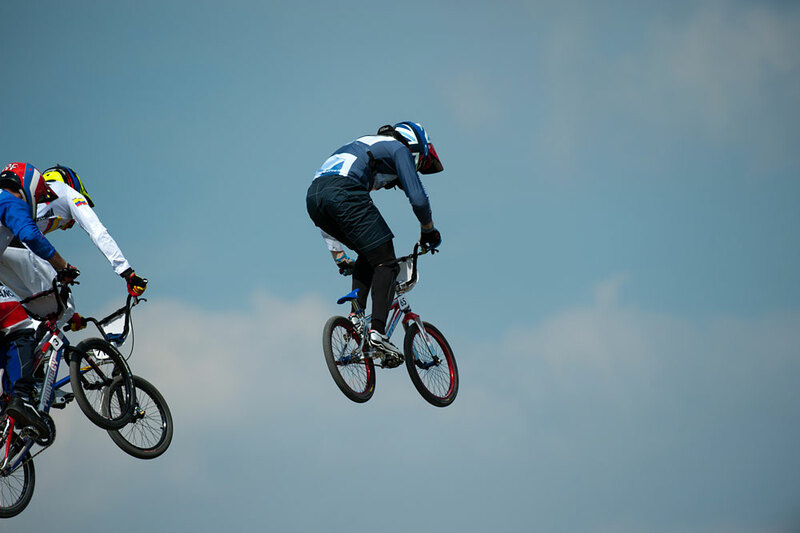 But BMX racing is so unpredictable that sometimes you don’t even need to make a mistake and your race day is over because of somebody else’s error. I knew my strength was a good start, and it was apparent from the first race that if I kept on performing I was going to be difficult to beat. What can you remember about sitting on the start ramp in the moments before the final began? LP: It was a very similar feeling to the Olympics last year, although in London, it was slightly different because there was a home crowd and people were chanting my name, which added a little pressure. I didn’t feel that in New Zealand – I was very relaxed and interested in getting about my business. I go through the process of practising the start in training, and it showed, as the best start I had all day came in the final. How quickly after crossing the finish line did it sink in that you had won the race? LP: Probably when I hit into the crash barrier [at the end of the finishing straight]. I’ve been in positions before where I’ve allowed myself to realise what position I’m in and the significance of the race, and before I knew it I got passed. It’s extremely easy to do that, particularly in the World Championships final, so until I had crossed the line I didn’t get carried away. I remember letting out a big “YES!” when I went into the barrier – that was a mixture of relief and happiness. It’s been a long time coming. Your race-winning bike did not make it back to Britain at the same time as you. Has it arrived yet? LP: [Laughs] Yes, both of my bikes turned up this morning [July 31]. I don’t know what it is, it’s certainly not the first time and it won’t be the last, but whenever I’m travelling back from big races, this always seems to happen. Do you plan to keep it as a souvenir of your achievements? LP: The bikes from the Beijing and London Olympics are actually at my parent’s house. They decided to keep them there, and they’ve got them on display, which is pretty cool. This bike is arguably more important, but I’ve got a few races left this season, so it may have to come out and be raced before anything else happens to it. I hadn’t seen my mum and dad for quite a while, and they surprised me by coming to dinner when I got back to England. They’ve obviously put a lot into my career emotionally and financially since I was a young child, so it’s good for them to have some reward for their efforts. Does winning the world title make up for missing out on a medal in London 12 months ago? LP: No, I don’t think it does. You only get one shot at winning an Olympic gold at a home Olympics. For me, this is a new chapter. Each year is about achieving something different, something better. Last year, I had some success, but I was determined to win even more this season. I’m treating next year and the road to Rio in exactly the same way. Was it nice to win a world title before your girlfriend [track sprinter Jess Varnish]? Is there a friendly rivalry between you? LP: Not at all. I feel really bad for Jess because she’s had a difficult 12 months since the Olympic disappointment and then picking up a back injury. She works so hard and I’m confident she would have gone to this year’s Worlds and she would have got the reward for that work. She’s young, she’s one of the most driven athletes you’ll meet, so she’ll win more races than she loses I’m sure. Much has been made of the huge increase in the popularity of road and track cycling in Britain. Do you feel BMX is also experiencing a similar surge? LP: As a sport, I’ve been passionate about trying to raise the profile of BMX racing for a long time, so to have people willing to listen to me feels good. The number of people taking part has doubled at grass-roots level since Beijing, and it continues to grow, which is a start. At the top of the sport, we’ve got fantastic facilities and coaches, and the British Cycling Olympic Academy riders are hungry to succeed, so I think we can end up with the best racers in the world before long.